Deliver this Yummy Treat of 1 Kg Fresh Fruit Cake to the exquisite individual of your life and glut his/her soul with heightened merriment. 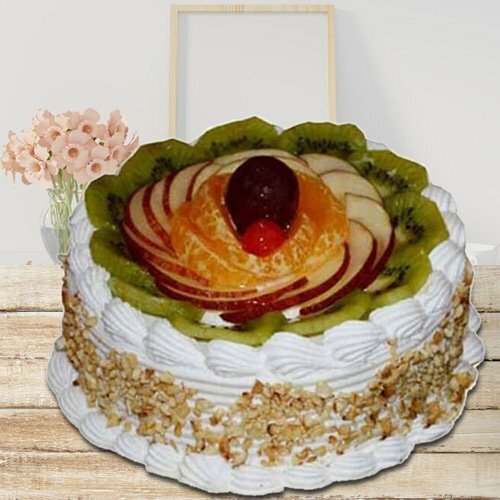 Celebrate a prized day that links both you and your beloved with this Mind Blowing Treat of 1/2 Kg Fresh Fruit Cake and allow profusion of sweetness bedeck your bond. While meeting a special one for the first time, carry this Premium Desire 1 Kg Eggless Fresh Fruit Cake as a gift for the one and saturate the tiny heart with loving thoughts of yours.